Sports journalism has had more than its share of driven individuals. But few compare with Harry Harris, the multiple award-winning football writer whose byline appeared on the London Evening News, Daily Mail, Daily Mirror, Daily and Sunday Express and Daily Star and Star on Sunday back pages. He won 24 industry awards over a 40-year career in newspapers. His accolades include the SJA’s scoop of the year award for breaking the news of Roy Keane leaving the Republic of Ireland’s 2002 World Cup squad. Many journalists turn to book-writing as a (not always) lucrative sideline, but no-one can compare – surely? – with the prolific Harris. He has been author of no fewer than 80 football-related books including autobiography collaborations, biographies and official club annuals. He has written with, or about, a diverse collection of players and managers, including George Best, Glenn Hoddle, Jurgen Klinsmann, Gianluca Vialli, Jose Mourinho, Ruud Gullit and Pele. And he hasn’t finished yet. 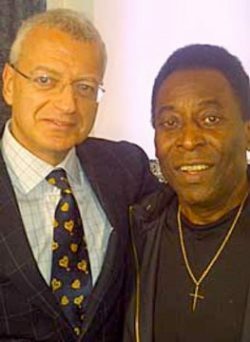 In May, an updated edition of Pele – His Life & Times is published to coincide with the World Cup, while Back Down Memory Lane, an updated version of his highly successful Down Memory Lane – A Spurs Fan’s view of the Last Fifty Years is planned for publication in August. Here, Harry Harris talks to NICK TOWNSEND who first met him more than four decades ago when both worked at the long-defunct Tottenham Herald. You and I go back many years – too many to mention! From the outset, it was apparent you were obsessive with football – and Tottenham Hotspur, in particular. Where did that drive originate? And how did you get your start? Still at school, I wrote a letter to the Tottenham Herald about Spurs which was published. I was about 16 at the time. It took off from there. I suppose the drive came from a pure love and passion for football. Unable to progress as a player, despite a few trials including my mum writing personally to Bill Nicholson and getting to see my when I played in goal for the school team, I couldn’t believe my luck that someone would actually pay me to go to watch football. Who else did you admire amongst your contemporaries? Victor Railton was my hero. On the Evening News, where I worked after the Herald, I ended up being his ‘runner’. He would send a cab to my house at the crack of dawn, dispatching me to places like White Hart Lane to hang around until a new signing arrived. Then I’d dash into the phone box to file every word from the new signing. Vic would put an intro on it, and it appeared a couple of hours later. Which of your stories gave you most satisfaction? Every single one. I enjoyed making the news, something that is hard to achieve these days, with social media, but still not impossible. 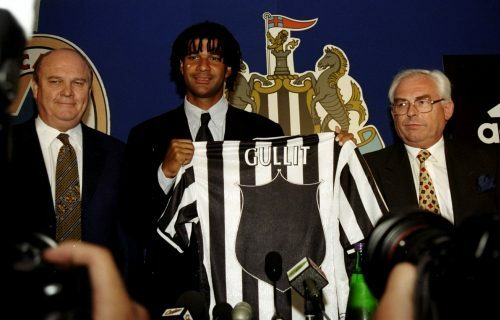 One of the most memorable was my story for the Mirror in 1998 when, on the same day, Newcastle sacked Kenny Dalglish and appointed Ruud Gullit – very satisfying when the same day the Sun’s back page had Gullit signing for Spurs as manager! On a different level, something people might know about me, is that I have campaigned for my entire career against racism in football. I mention it, with the subject being much discussed since the untimely death of Cyrille Regis. The then leader of the Labour Party, Neil Kinnock, sent an open letter to the Mirror praising our campaign which involved Everton, John Fashanu, Paul Davis, Brian Deane and many others who were brave enough to tell the full story of the bigotry inside the game. For that I won a Race in the Media award. Lord Herman Ousley presented it to me. You were renowned for your persistence – which player and manager was the trickiest to extract a story from? They were all tough nuts to crack. Bill Nicholson was notorious for dodging the media, but we got on very well. The old cockney charm worked wonders. My journalist teacher at Harlow College said I might not be the best writer, but I would charm the stories out of the trees. Who was the sports editor you most admired? Tom Clarke (left) . He gave me my big break at the Mail, and he put up with an awful lot in knocking a rough diamond into shape. Thanks Tom. Q – What advice would you give an aspiring young football reporter? Persistence and honesty. Not easy in our profession. Treatment of Football Injuries with the then Spurs physio Mike Varney. Writing books seems to have become an addiction. Not all books make a fortune. What’s the appeal for you? I enjoy doing something completely different. It’s almost therapeutic. It’s been reasonably successful as my books have sold more than 1 million copies. Apart from your books, what are your current projects? I run a sports PR business with Glenn Hoddle. It’s called H&H Sports Media. He thinks its Hoddle and Harris, but it’s Harris and Hoddle! Part of that involves running a sports/football internet site.